Reunited on Record for the first time since 1984 - The 4 Original Members of Grammy Award winning A Flock Of Seagulls. In the words of VH1 "A Flock of Seagulls is a Band Reunited". For the first time since 1984, all four original members of the band appear on Record together for their new album "Ascension". The recording puts a new and unique spin on their greatest hits by performing orchestral versions with the Prague Philharmonic providing extra backing. A Flock Of Seagulls may well be known for their bizarrely teased haircuts as much as their hit single "I Ran". A Flock Of Seagulls were one of prime movers in the 80's new wave era. Growing out of the synth-heavy and ruthlessly stylish new romantic movement. Hairdresser Mike Score (lead vocals, keyboards) formed A Flock Of Seagulls with his brother Ali (drums) and fellow hairdresser Frank Maudsley (bass) in 1980, adding guitarist Paul Reynolds several months later. The group released its debut EP on Bill Nelsons Cocteau Records early in 1981, and while the record failed to chart, its lead track, "Telecommunication" became an underground hit in Euro-disco and new wave clubs. The band signed a major-label contract with Jive by the end of the year, and their eponymous debut album appeared in the spring of 1982. "I Ran (So Far Away)" was released as the first single from the album, and MTV quickly picked up on its icily attractive video, which featured long shots of Mike Score and his distinctive, cascading hair. The single climbed into the American Top Ten, taking the album along with it. In the UK, "I Ran" didn't make the Top 40, but "Wishing (If I Had a Photograph of You)" reached number ten later that year; in America, that single became a Top 40 hit in 1983, after "Space Age Love Song" peaked at number 30. "Wishing" was taken from the group's second album "Listen" in 1983. The band released 1984's "The Story of A Young Heart" which fielded the minor hit "The More You Live, The More You Love". Shortly after Paul Reynolds left the band. Mike and Ali moved to the US shortly after basing themselves out of Pennsylvania. The band now as a trio released the album "Dream Come True" in 1986. Ali and Frank left in the years afterwards. Mike released the "Light At The End of the World" album in 1996. A Flock Of Seagulls never really broke up. Mike carried on touring with session musicians and quietly, surely and steadily the folk lore surrounding the band began to grow. The references in culture from TV (Ross's Haircut in Friends), Computer Games ("I Ran" was the standout track on Grand Theft Auto Radio), Film (The band and haircut are referenced in Pulp Fiction, X-Men and The Wedding Singer) cemented the bands reputation and brought the band to a whole new legion of fans. In 2003, the original line-up of Mike, Ali, Frank and Paul reunited for a one-off performance on the VH1 series Bands Reunited. In September 2004, they reformed again and did a brief tour in the United States. From 2004 to 2017 Mike was as busy as ever touring the band around the world. In 2017 the band appeared on record together for the first time since 1984. 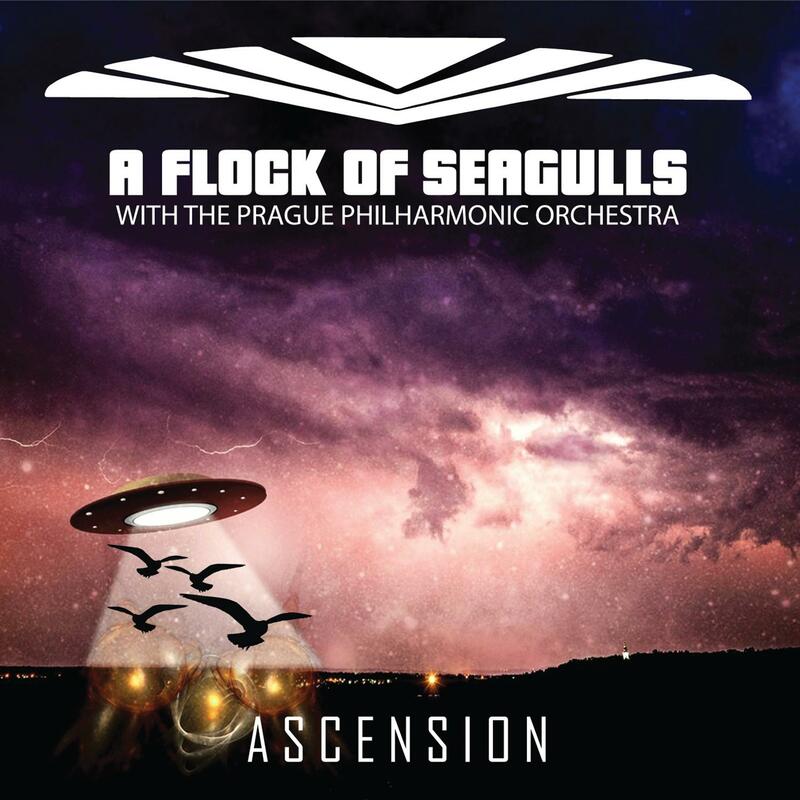 The "Ascension" album was recorded in multiple studios around the world and featured the Prague Philharmonic Orchestra providing backing to their hits. Mike Score would like to thank Ceena Score, Patricia & Peter Score, Imagem, Paradise Agency, Boss Agency and Everyone concerned with getting us together to make record.